A Forbes’ top-five coach and renowned management guru, Professor Dave Ulrich of the University of Michigan’s Ross School of Business headlined this year’s HR Talks: Monica Belcourt Speakers Forum. On Sept. 25, in front of a sold-out crowd comprised of graduate students, faculty, alumni and HR professionals, Ulrich shared his views on emerging challenges and opportunities for human resources professionals. He challenged the audience to keep all stakeholders in mind when emphasizing the importance of their work, and align their efforts with the goals and values of their organizations. 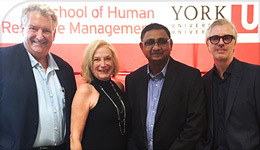 Using examples of his work with Fortune 500 companies and CEOs, he emphasized the need to align the role of the HR professionals to the core business of the organization. “I left David’s presentation feeling proud to be an HR Professional! HR is not about what we do, but rather the value we create in others. He left us with practical take-aways that we can start implementing right away – bring stakeholders in on designing learning programs for employees. He was brilliant, and made the presentation fun and engaging. I didn’t want it to end!” said Vanessa Capogreco, manager, Talent Development, at York University. The annual HR Talks: Monica Belcourt Speakers Forum was established in 2015 to bring thought leaders in the field to the School of Human Resources Management. The speaker series is named after Professor Emerita Monica Belcourt, founder of the School of HRM in the Faculty of Liberal Arts and Professional Studies and a HR trailblazer in her own right.